Quick Questions in Sport-Related Concussion: Expert Advice in Sports Medicine provides a unique format of concise and to-the-point responses with clinical application, backed by the latest research on sport-related concussions among athletes. Dr. Tamara C. Valovich McLeod and her contributors present 39 common clinical questions regarding the many different guidelines, consensus, and position statements that have garnered increased attention in the media and literature. Co-published with the National Athletic Trainers’ Association, Quick Questions in Sport-Related Concussion: Expert Advice in Sports Medicine provides concise answers to 39 frequently asked clinical questions. Written in a conversational tone, the authors of the individual questions represent a variety of different backgrounds and are experts in their respective field. The variety of questions and brevity of responses will make this a book that is easy to read and reference at the point of care. o What are the best educational materials available to help a coach, parent, or athlete learn about concussions? o What are the most important regulations and policies to consider regarding the management of sport-related concussion? o How common are vestibular deficits following sport-related concussion, and what tools are best used to assess vestibular function? o Are there any rehabilitation exercises you can do to help a concussed athlete heal faster? o What is the role of the graded exertion protocols for making RTP decisions? o What is cognitive rest, and can it help recovery following concussion? 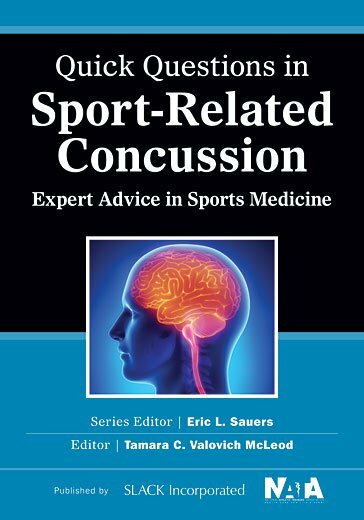 Quick Questions in Sport-Related Concussion: Expert Advice in Sports Medicine is the perfect at-your-side resource for the athletic trainer, team physician, or sports medicine clinician looking for practical answers to sport-related concussion questions. The concise and conversational tone allows the reader to readily apply the information into their everyday practice. Question 2 How Common Are Sport-Related Concussions? Parent, or Athlete Learn About Concussions? Question 7 Is It Imperative to Perform Baseline Testing? Question 9 What Are the Most Important Regulations and Policies to Consider Regarding the Management of Sport-Related Concussion? Question 10 What Factors Aid in the Prevention of Recurrent Concussion? Question 12 What Should Be Included in the On-Field or Sideline Examination to Diagnose a Suspected Concussion? Immediate Referral to the Emergency Department? With Baseline Neurocognitive or Balance Tests? and if so, How Do I Measure This? Question 17 How Common Are Vestibular Deficits Following Sport-Related Concussion, and What Tools Are Best Used to Assess Vestibular Dysfunction? Question 19 Does Recovery on Clinical Tests Represent True Recovery of the Brain? Differently From Those in Adults? Question 22 How Many Concussions Are Too Many Before an Athlete Should Retire? Question 23 What Are the Long-Term Concerns With Concussion? Future Negative Sequelae as Athletes With Diagnosed Concussions? Learning Disabilities, Epilepsy, Depression, or Anxiety? of Concussion on a Patient’s Quality of Life? Question 32 How Long Should Patients Be Free of Symptoms Prior to Beginning a Gradual Return to Activity? Recommending That Patients Purchase Them? Question 37 How Can Concussion Negatively Affect School Functioning? Who Are Attempting to Return to the Classroom? Who Should Be Part of the Decision-Making Process? Tamara C. Valovich McLeod, PhD, ATC, FNATA, is the Athletic Training Program Director, Professor of Athletic Training, and the John P. Wood, DO, Endowed Chair for Sports Medicine at A.T. Still University in Mesa, Arizona. Dr. McLeod completed her doctor of philosophy degree in education with an emphasis in sports medicine from the University of Virginia. She is the director of the Athletic Training Practice-Based Research Network, and her research has focused on the pediatric athlete with respect to sport-related concussion. Her current work is investigating the short- and long-term effects of pediatric sports concussion as well as recovery following concussion on traditional concussion assessments and health-related quality of life. Dr. McLeod also has research interests regarding gender differences in lower extremity function, specifically neuromuscular control and postural stability, and studies these areas through an injury prevention approach in younger athletes. Dr. McLeod was a contributing author for the National Athletic Trainers’ Association (NATA) Position Statement on the Management of Sport-Related Concussion, the lead author on the NATA Position Statement on the Prevention of Pediatric Overuse Injuries, and a consultant and contributing author on the Appropriate Medical Coverage for Secondary School-Aged Athletes. Dr. McLeod serves on numerous editorial boards, publishes frequently in athletic training and sports medicine journals, and is an NATA Fellow.